As the host of this month's Session, I have a confession to make, I have no idea where to go with our common theme of Czech beer. There are so many potential avenues for my post today. I could talk about how that very first half litre of Budvar 10° in a Černý Most pizzeria has lead to a life long appreciate of the youngest of the claimants to the Budweiser name. I could talk about Kout na Šumavě's magnificent 14° tmavé that was the inspiration for Morana, my first brewing collaboration in the US with Devils Backbone. I could regale you dear reader with tales of kicking kegs of rare, at the time, beer styles with noted beer writers like Evan and Max. I could even ramble on about my ongoing mission to find an American made Bohemian Pilsner worthy of the name, thankfully there are a couple available in Virginia - looking at you Port City and Champion Brewing. Naturally plenty of other words for drinking dens have crept into the language, "bar" and "lokál" being two of the more obvious examples. I am sure there are some out there that would want a taxonomical definition of the difference between a hospoda and a pivnice, but it would largely be an exercise in splitting hairs, and thus pretty pointless. The fact remains that the Czech hostelry is to the Czech Republic as the church is to the Southern states of the US, ubiquitous and largely indistinguishable one from the other. 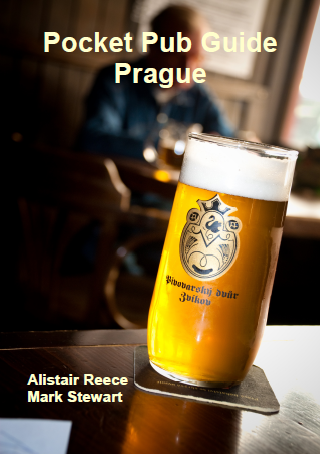 From my experience the pub is the epicentre of Czech life, not just a place to go for a drink. It's the place where after some time you get to know the staff, if not by name then very much on a nodding acquaintance level. If you go often enough to particular places your regular tipple is on the table just as you take off your coat and they will keep on coming until you tell the servers to stop, a tricky proposition when the next beer usually arrived with a finger or so of the current one still in the glass. 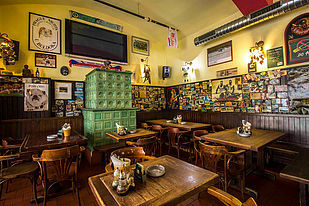 Czech pubs are just as much a sociable place as they are a social centre, let me give you an example. You walk into a bar and there are people sat at every table, here in the US you do one of two things, wait for a table to open up or try somewhere else, in the Czech Republic you find the table with enough space for your group and ask if the seats are taken, if not you join that table. There is something about that friendly exchange with a stranger that I miss, maybe because it was this way of doing things that helped me overcome the crippling shyness of my teens and early twenties. When your beer comes, you cheers your new table mates and on you go, knowing the cheers will be reciprocated. In that interaction strangers become acquaintances, and sometimes even friends, and so the pub achieves one of its great purposes as society's greater leveller. 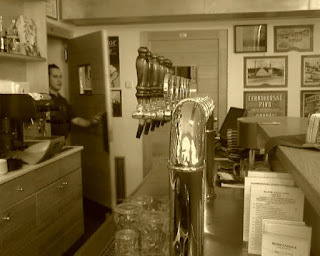 Throughout the decade of writing Fuggled I have no doubt waffled at length about my favourite pubs in the Czech Republic, Pivovarský Klub where I met Mrs V, Zlatá Hvezda where I watched Liverpool twice a week most weeks during the football season, or even Bruska, the place with just tankové Pilsner Urquell on tap, but that was irrelevant because it was a damned good pint every time. One place though that I rarely seem to have mentioned, and also the beer that pulled me there time after time, is U Buldoka - in fact a quick search of the site shows that I have made passing reference to it all of twice. The beer that I drank in U Buldoka was always Zlatá labuť Světlé Kvasnicové pivo 11°, brewed by Pivovarský dvůr Zvíkov. Whenever I throw my mind back to the many, many half litres I drank of this beer, two descriptors come to mind, sherbet and pear drops. Zlatá labuť 11° was a lovely, lovely beer - having not had it in nearly ten years I can't comment on what it is today - and U Buldoka was a great place to sit for an afternoon and just merrily drink your fill. One of the delights of U Buldoka in winter is the big green thing you can see in the picture above, which I got from the U Buldoka website. That my good people unversed in the ways of Central Europe is a masonry heater, used for radiating heat throughout the room by virtue of a fire in the belly of the beast. These things are phenomenal at keeping a room warm, and so sitting a good distance away in the middle of winter becomes an art form in itself. Come summer, the fire is not lit, so it makes a handy place to prop yourself up against and use for stashing empty glasses. When I was writing the Pocket Pub Guide to Prague, several of the pub tours just so happened to pass close to U Buldoka, so my photographer Mark and I would finish up the chosen route for the day and then pop in for a pint or several, well ok then, just several. U Buldoka has so many of the things that I associate with a "good pub", dark furniture, dim lighting when the evening comes (nothing worse than glaring light bulbs to ruin a place's atmosphere), good beer, efficient staff, and simple but filling food. There are times when I would like nothing more than to take my twins for a stroll along the Vltava, perhaps from Čechův most down to Smíchov, crossing the river a couple of times, finishing up at U Buldoka for a well earnt pint or several, oh who are we kidding, several. May be one day Mrs V and I will get back there, until then there are always the wonderful memories.